We will be closing at 2pm Christmas Eve, and will be closed on Christmas. Merry Christmas! In addition to our lineup of high-quality vehicles that offers many choices for drivers with different wants and needs, there’s also our car service and repair center. We train and retrain to help ensure the vehicle you buy or lease from us continues to satisfy you for hundreds of thousands of miles to come. What’s more, we use certified Honda parts that are also available to the DIY-types out there. This way, you know you’re vehicle is being treated right, from start to finish. At Honda of Greeley, we not only offer a superb selection of new and used Honda models, but also premium customer service. Our expert staff is ready to help you make truly informed decisions about everything from cars, service, and parts. We invite you to browse our diverse inventory of new Honda models like the Accord, CR-V, HR-V, Civic, Pilot, or Odyssey. Perhaps you’re interested in ample cargo room to make family trips easier, or maybe you’re looking for that special sporty ride for weekend driving. 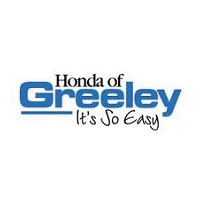 In either case, Honda of Greeley has you covered. Helpful staff. The parts department was the mission of the day. They were helpful easy to work with. Prices aren't exactly great but no dealer parts ever are. I'm actually working with Josh from Hyundia and he been GREAT!!! !